There was probably a time when you thought you could still get away with having a fabric, pale-coloured lounge suite with a growing toddler. Time no doubt proved you wrong. We recently posted a piece on why you can’t get anything done with a toddler, and wow, you guys came up with some eye-popping real-life examples. 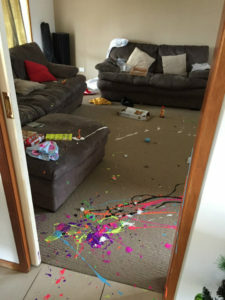 As an ode to the mayhem our kids bring to each day, we have compiled the six most common ways your kids will ruin your things (and occasionally your day) based on the influx of images Babyology readers sent our way. Megan Perceval just popped out to clean the pool. That’s when her three-year-old daughter found the paint. So many pretty colours. And while we think this would look downright incredible on a canvas, the floor is a whole other story. We’re still trying to figure out how Megan managed to actually clean this up. We’re guessing her tears didn’t do the job for her. What is it with Sudocrem? It is almost a rite of passage that at one point your toddler will find the tub, unscrew it and manage to put it everywhere but on their nappy rash. Take these three different toddlers – they each found three uniquely different ways to enjoy the skin-enhancing benefits of a tub of Sudocrem. Anna Szewczyk’s little guy dunked his toy and toothbrush. 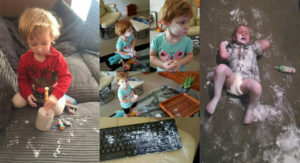 Sharon Smith was just putting on a load of washing when her daughter smeared cream on herself, the remote, and the computer keyboard (?!) And Natasha Hammill’s bub just went for the full-body/carpet rub-down. What fun! 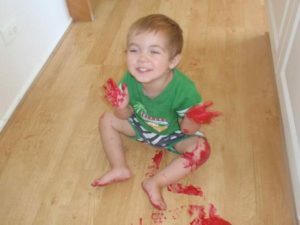 You could be forgiven for thinking we are showing you a picture of a murder scene, but don’t worry, Tammy Humphrey’s son just wanted to try on some red nail polish. What this picture doesn’t show you is that there was also white carpet involved. Turns out your favourite Big Apple Red OPI actually holds a place in your toddler’s heart, too. Time to store your polish behind lock and key. 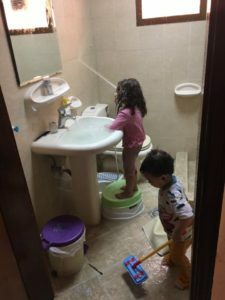 Always keen to do big kid things, toddlers have a habit of trying on a little independence before they know all the steps involved to successfully complete the task. Take washing your hair for example. Yasin Isa Jaleelah’s daughter decided it would be a great idea to take the handheld shower nozzle and give her hair a good wash. Thanks to an overflowing tap, she also managed to clean the floor too. At least her little brother helped with the clean up. The pantry can often be a mum’s slice of ordered organisation in a life full of chaos, you have your Tupperware, your neatly labelled jars, your snack corner and then you have your toddler, climbing in to ruin it all. Nope, not even the pantry is safe. 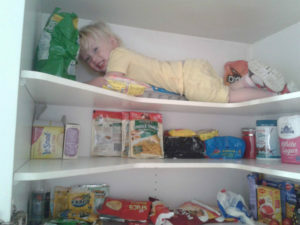 Ten points to Haley Barrett’s daughter, who actually managed to climb to the FIFTH shelf of the pantry to get those rice snacks. Note the carton of eggs, which hopefully survived the crush. If the girl does this for rice cakes, we would hate to see what she would do for chocolate! If you think you were safer with dark carpet, you’d be wrong. 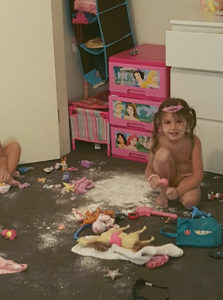 Princesses, horses, cornflour … not sure what Belinda Hall’s little girl had in mind here. But there’s something about flour mushed into dark carpet that makes us want to cry. Have you got a good pic of your toddler? Please share!